Salvation And Survival: 1 Peter 3:18-22 ... Baptism Is Spiritual Warfare! 1 Peter 3:18-22 ... Baptism Is Spiritual Warfare! 20 [The souls of those] who long before in the days of Noah had been disobedient, when God’s patience waited during the building of the ark in which a few [people], actually eight in number, were saved through water. 22 [And He] has now entered into heaven and is at the right hand of God, with [all] angels and authorities and powers made subservient to Him. This is a controversial passage in the Bible for a number of reasons; and you will often find the shepherds of Jesus's flock ignoring it because they do not understand the full significance. But we should not be afraid to tackle Scripture, even if it means setting aside the theological traditions of our particular denominations. Let's let Scripture say what it says. Whenever one studies the Word of God, we must be careful to discern the whole counsel of God; in other words, consider a passage within the context of the entire chapter or the particular book of the Bible. In 1 Peter, which is only 5 short chapters, the Apostle is speaking about the role persecution will play in the lives of new Christians, and how we must persevere in our faith. He makes it clear that our response to persecution is all-important. In fact, we are to imitate Christ, who suffered for us, and is in turn, our living Hope. And out of our perseverance we will develop character that is rooted in submission throughout our lives ... submission to the government; submission in business; submission in marriage -- submission in all of life, which includes suffering and persecution. First, we have the declarative statement that Christ died for our sins; for the sins of all -- righteous and unrighteous; just and unjust; innocent and guilty. The Scripture makes it clear that His human body was killed, but His spirit was alive and he "preached to the spirits in prison." What does this refer to? Well, 2 Peter 2:4 spells it out pretty clearly ... "For God did not [even] spare angels that sinned, but cast them into hell, delivering them to be kept there in pits of gloom till the judgment and their doom." Sounds like "spirits in prison" to me! We should also be able to agree that some time between His death and resurrection, Jesus visited the realm of the dead where He delivered a message to spirit beings. This is referenced in Ephesians 4:8-10 (Therefore it says, “When he ascended on high he led a host of captives, and he gave gifts to men.” In saying, “He ascended,” what does it mean but that he had also descended into the lower regions, the earth? He who descended is the one who also ascended far above all the heavens, that he might fulfill all things). We know that he took the righteous with him to Heaven when he ascended after His resurrection. (He tells the thief on the cross, "Today you will be with me in Paradise"- Luke 23:43). But what about the unrighteous who are mentioned in Luke's account of the rich man in Abraham's bosom (Chapter 16) -- or the fallen angels who did not "keep to their first estate (heaven)" and to whom "He has reserved in custody in eternal chains (bonds) under the thick gloom of utter darkness until the judgment and doom of the great day" (Jude 6)? It is very important that we recognize that the "angels that sinned" mentioned in 2 Peter 2:4 and Jude 6 are one and the same; they are fallen angels -- the very ones that Genesis 6:1-4 is talking about. They are the ones that came to earth and mated with human woman, producing Nephilim (hybrid) offspring. Subsequently, these are the "spirits in prison" mentioned in 1 Peter 3:19. And Peter identifies them as such in the very next verse! They were the "disobedient" ones in the days of Noah (referring to Genesis 6:1-4 again); in the days that God was patient while Noah built the ark. And then we all know what happened after that, right? God wiped all the corrupt flesh and the disobedient ones off the face of the earth with the Flood. Only Noah and his family survived God's punishment. As those last words in 1 Peter 3:20 say, "they were saved by water." The following verse makes it very clear that Baptism is "a figure" of the Flood -- an illustration or a representation of the same effect of the Flood. Very simply, it is a theological analogy. And we must understand that Baptism is not an act that yields salvation. Being baptized does not offer or result in the act of salvation from the justified wrath of God for the commission of sins. The Scripture tells us in verse 21 what it saves us from -- it saves us from ever doubting or fearing our salvation. Baptism does not involve the washing of our robes to white (or the cleansing of our souls), but it is actually done as a declaration of what you have gained through your faith in the resurrection of Jesus Christ as your Savior. It is your response to the free gift of salvation, and a proclamation to the spiritual realms , telling them who you belong to; to whom you are obedient. In fact, the Greek translation of verse 21 says Baptism is "the witness" of a good conscience toward God -- by being baptized, you are witnessing to the spiritual realms that once again God has buried sin (through water) to give rise to another soul that is regenerated. It is something you do to present yourself as belonging to God; it declares your witness TO the spiritual realm and your pledge BEFORE God. To put it in simple terms, verse 19 says that Jesus preached to "the spirits in prison". What did He preach? He told them that they were still defeated despite His crucifixion, and they would remain there until the Great Day of Judgment. When we are baptized, it once again declares to those spirits that they are still defeated ... that Jesus has risen and He is the agent of our Salvation! Our baptism represents Victory (just as did Jesus's resurrection) over every demonic spirit, whether imprisoned below, or in the spiritual realms. And to seal the deal, verse 22 announces His resurrection and that Our Lord has entered Heaven, sits at the right hand of the throne of God, and [all] angels and authorities and powers [are] made subservient to Him! If you doubted that Baptism is part of our spiritual warfare, please note the language that Peter uses here ... angels, authorities and powers. This is the same language that Paul uses in his letter to the Ephesians as he instructs them in spiritual warfare ... For our struggle is not against enemies of blood and flesh, but against the rulers, against the authorities, against the cosmic powers of this present darkness, against the spiritual forces of evil in the heavenly places. It is important as modern Christians, that we make this connection ... this kind of language was common and well-understood in the first century Church. It has been all but lost in today's culture ... except for Satanists, occultists, witches, and the like who understand that there are rulers, authorities, powers, and spiritual forces of evil! Think how much more effective we could be as Christians if we recognized that we are in a spiritual war for men's souls! Think about what it says to the spiritual forces of evil when you make the heart decision to pledge your allegiance to the risen Lord through the act of Baptism ... you are saying that you are on the Lord's side in the cosmic war of Good and Evil! 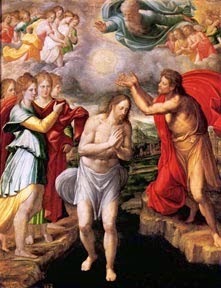 Every baptism is a further renunciation of those fallen angels, still in prison, and who sought to corrupt mankind. In the Early Church, baptism rites included a formal rejection of Satan and his angels, for that very reason! Believers were asked, ""Do you renounce Satan, and all his angels, and all his works, and all his services, and all his pride?" They were then asked, "Do you unite with Christ?" The renunciation of Satan and the union with Christ expressed faith that the newly-baptized person had been transferred from one master (the Prince of this world) to another (Jesus Christ, Lord and Savior, and Son of the Living God). At that time, baptism was clearly part of spiritual warfare ... it still ought to be recognized as such today! What you said is so true, there is a life after death but I'm not sure what are dreams that comes in the minds of people while living in this world.